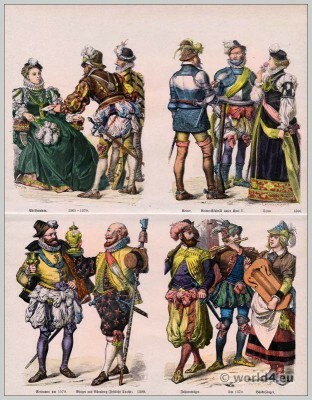 Home » German Renaissance Fashion in the 16th Century. German Renaissance Fashion in the XVI. Century. Top row left: Noblewomen and noblemen in Spanish fashion of the years 1565-1570 Right: Knight and General in armor and armament under Emperor Charles V,. German lady in the Spanish fashion of 1560. Bottom row left to right: German nobleman in the fashion of 1570. Citizen of Nuremberg in festive costume from the year 1588. Right: Standard bearer and flutist in Spanish pants and doublet, ballad singer to 1570. This entry was posted in 1560, 1570, 16th Century, Germany, Middle Ages, Military, Renaissance and tagged Münchener Bilderbogen, Renaissance fashion era, Spanish Fashion on 1/10/14 by world4.